We have just 9 Wellington Yellow Whirls available, this combination has never previously been issued. 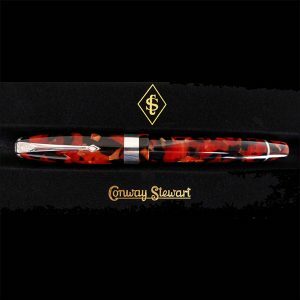 So if you would like to add one of these very limited edition pens to your collection, you’ll need to do so quickly. Once these have gone, they’re gone! 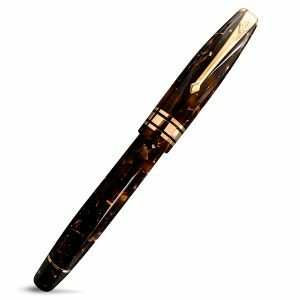 The Wellington is a substantial pen which has been crafted with a subtly curvaceous form to both cap and barrel. 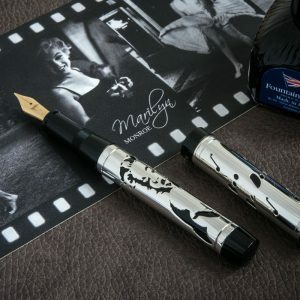 It is this exciting shape that sets it apart from traditional pen designs. The Conway Stewart Wellington Yellow Whirl that is both classic and contemporary. A whirlpool of yellows and reds and silver fairy dust are perfectly complimented by two 9ct gold cap bands – one wide and one thin. There are also two 9ct gold rings on the pen barrel – one above the nib holder, and one at the barrel end cap. 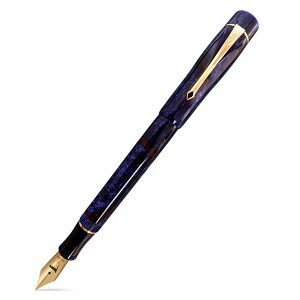 As you turn the pen in daylight, the Yellow Whirl shimmers as light is reflected from the silver dust in the blue resin. Each Conway Stewart Wellington Yellow Whirl pen comes in a Conway Stewart black leather presentation box which also serves as a showcase pen stand for your desk, together with a Certificate of Authenticity, Conway Stewart User Guide and an anti-tarnish pen cleaning cloth to keep it in sparkling condition.